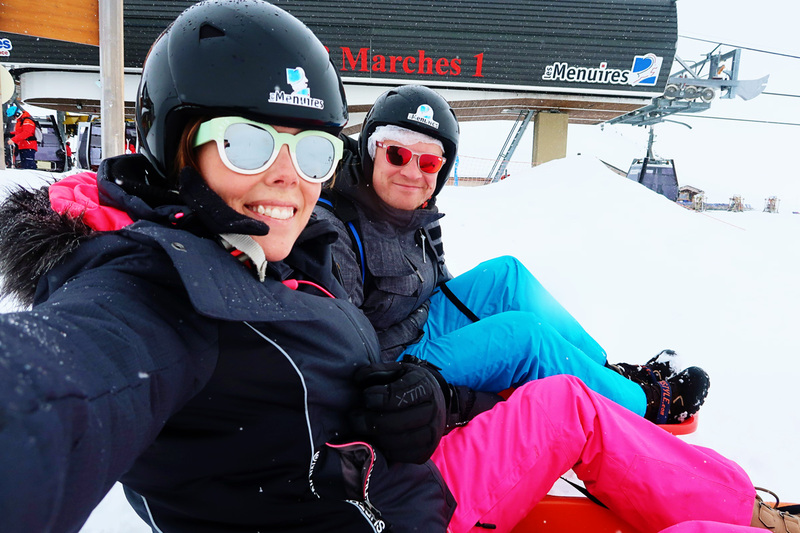 However much I love a sunny climate and find myself excitedly wishing Spring/Summer would hurry around the corner, last year we found ourselves on our first ever ski holiday. I went into it completely open minded, I was a true summer holiday type of girl but I was excited to see what it would be like. 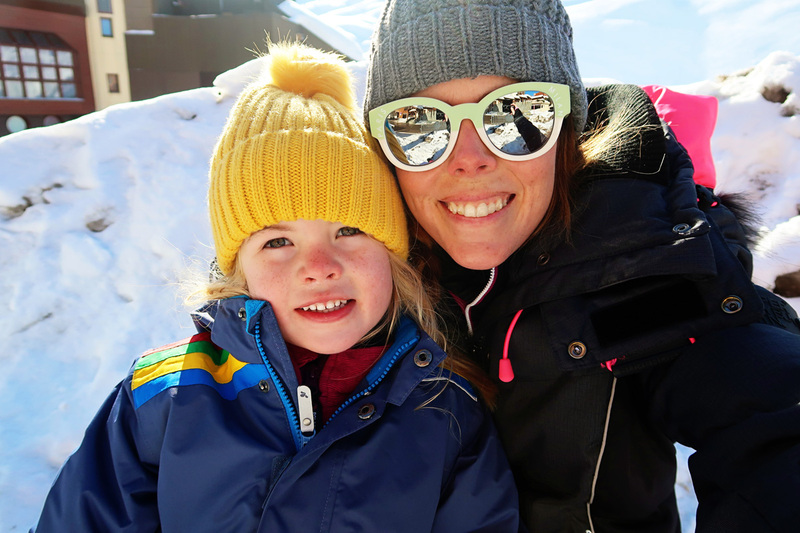 We went to Les Gets in the Alps with Ski Famille and it was quite simply one of the best holidays we have ever been on. (You can read the posts about it here, here and here). We loved every second of being up there in the mountains and although we were complete beginner skiers, we enjoyed every single moment. Pretty much as soon as we got home we decided to book again and we were thrilled when Ski Famille asked if we would like to try a different resort this year. 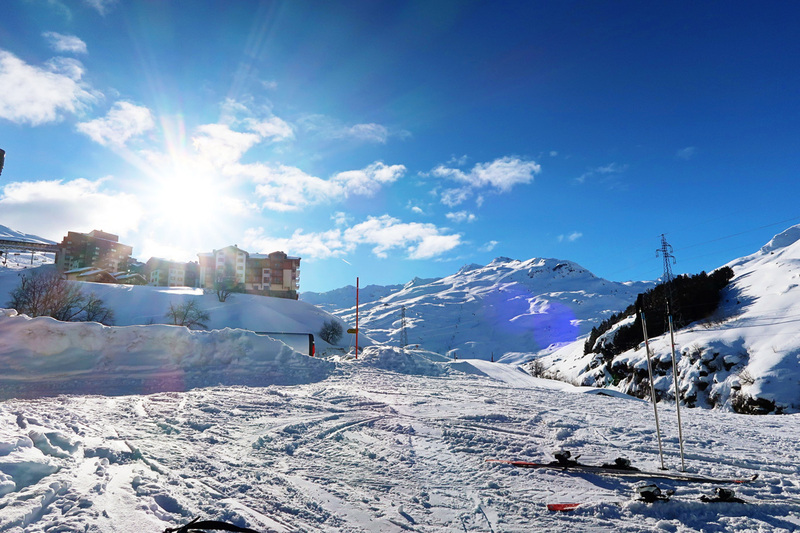 So we excitedly counted down to our February half term ski holiday. 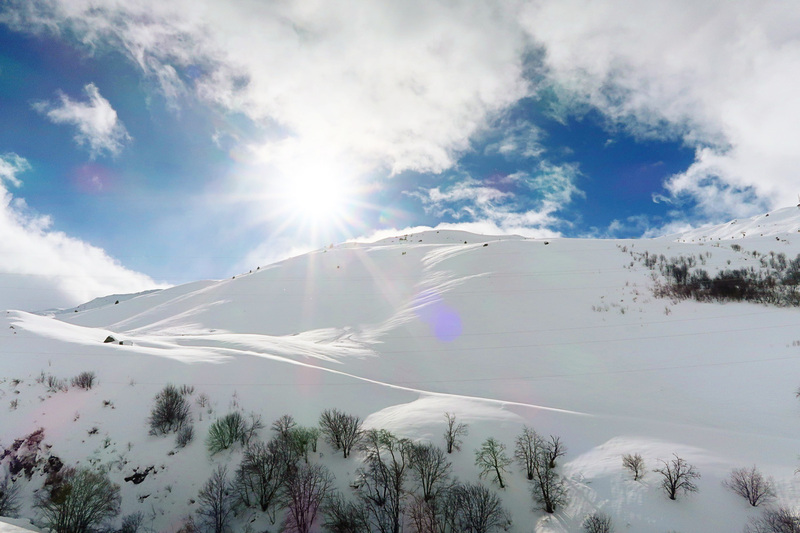 This year we decided to go to a higher altitude resort- Les Bruyeres, still in the French Alps. (For those non skiers amongst us the higher the altitude the more likely you are to get more snow). 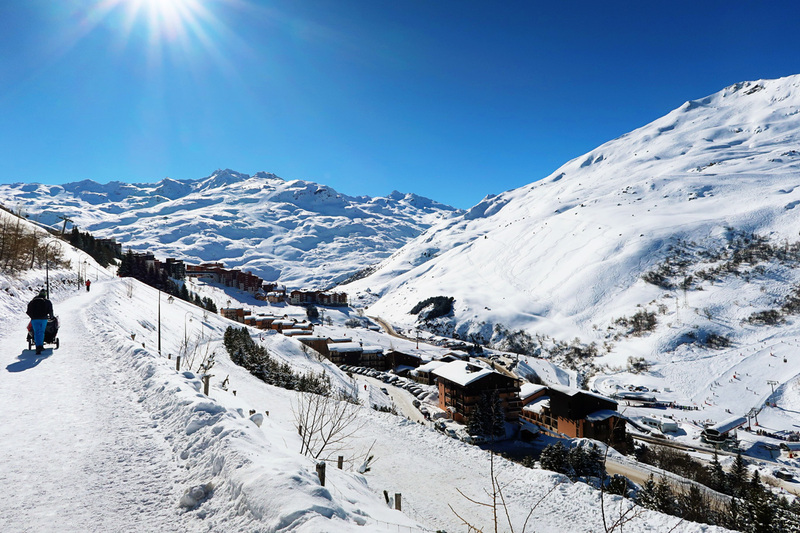 It’s in the world famous 3 Valleys- the largest ski area in the world (and breathtakingly beautiful). 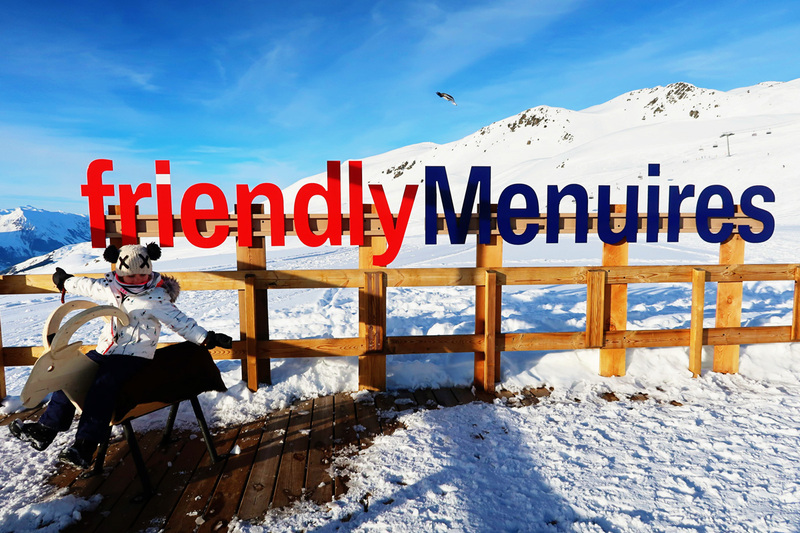 Close by in the same area is Les Menuires- Situated at an altitude of 1850m, the resort of Les Menuires has all the advantages of a ski from the doorstep resort. We were staying in one of Ski Famille’s Premier Select Chalet’s, Chalet Faucon which has actually recently been voted the joint fourth best chalet in Europe by The Times. I will be talking a lot more about the chalet itself in my next post. If you haven’t ever been to a ski resort before then I don’t think you truly explain what it is like up there in the mountains until you have actually experienced it for yourself. Firstly it is stunningly beautiful, especially when there is fresh powdered snow on the ground and bright sunshine and blue skies. It’s a take your breath away kind of beauty and I spent most of our time in Les Bruyeres telling Jon ‘it’s just so beautiful here’ over and over. I think because I come from a non skiing background I didn’t automatically arrive in Les Bruyeres and think straight about the skiing aspect. I want to go to a resort that has activities that we can do when we don’t want to ski, that has beauty and charm, and that is beautiful. Those are the things I want from a ski holiday, I don’t just want skiing as while I really enjoy skiing, unlike a lot of ‘proper’ skiers my holiday doesn’t just focus on that all day every day. Les Bruyeres had it all in abundance. We arrived in Geneva, crossed the border into France, met our Ski Famille representative and transferred the 2.5 hour journey up into the mountains. In all honesty the transfer isn’t much fun with young children, but if you want to get to the seriously good white stuff then it’s worth it. What activities are there in Les Bruyeres? 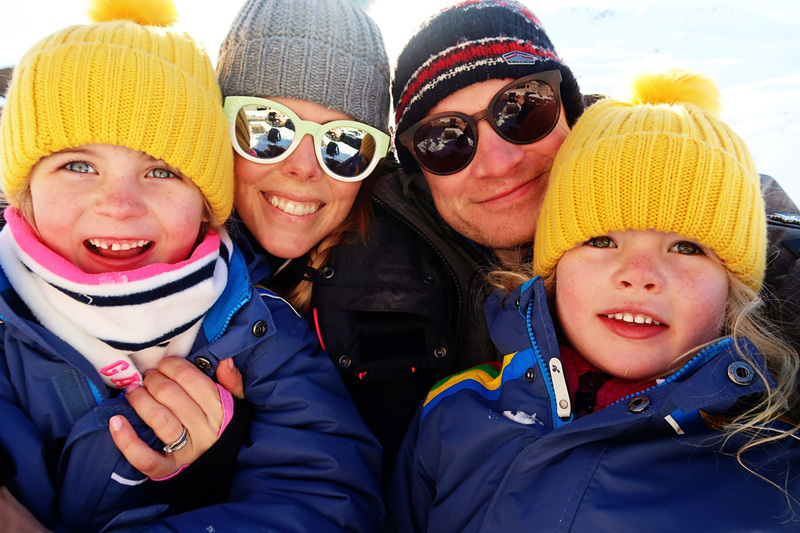 Of course I am going to talk more about the skiing and skiing for beginners as I go along, but I actually wrote a post on this last year (it’s a skiing as a family for the first time Q&A post). But like I said a little further up while of course we go on a ski holiday to ski, this isn’t the sole focus for us. 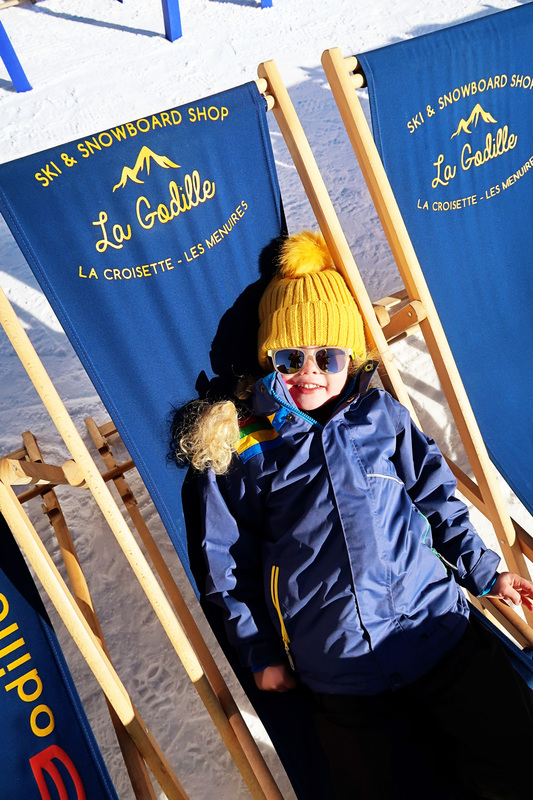 We go on a winter holiday to be together, to eat nice food, to spend quality time together, and we were intrigued to see what Les Bruyeres had to offer as our resort last year Les Gets was so family focused. We need not have worried, Les Bruyeres was absolute perfection for families. It’s a small resort, with a few different restaurants and a little square with a bakery, supermarket etc. You are also within walking distance of Les Menuires centre (which is about a 10-15 minute walk via a beautiful snowy path with an amazing view). There is also a free bus which does a loop around the resort and surrounding resorts many times a day. 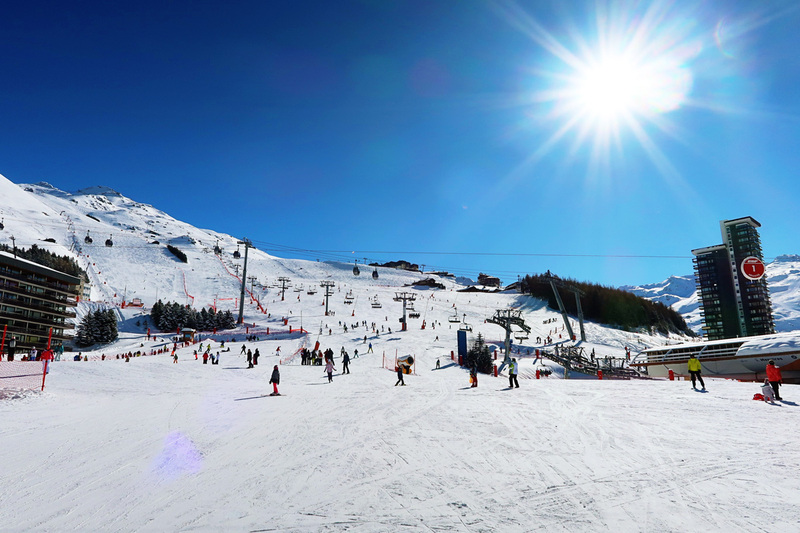 Les Bruyeres isn’t lively (as in with a lively nightlife) but it is perfectly suited to families who want a busy and bustling resort for families. Sledging can be done anywhere of course, but for safety it’s probably best to stick to the official sledging areas. In Les Bruyeres this is in nearby Croisette (which is about ten minutes away walk and a great busy little area of restaurants, bars, skiing etc). 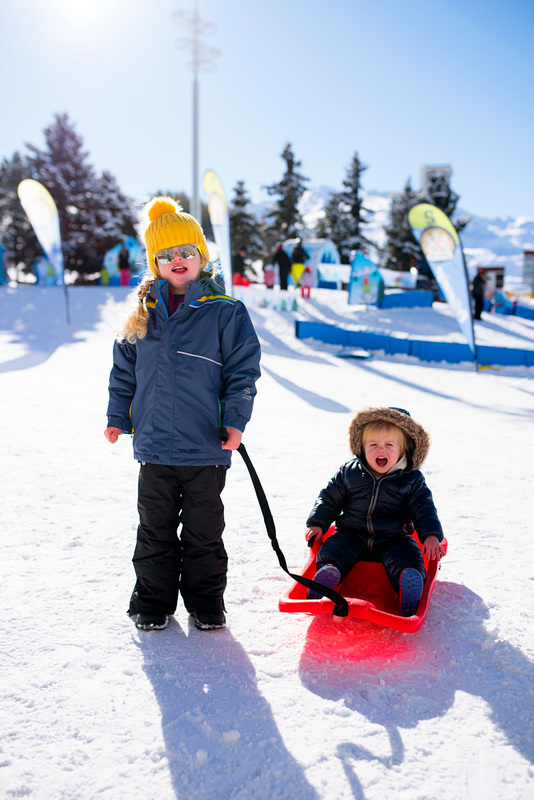 There is a great family sledging area, with slides and igloos for the little ones. 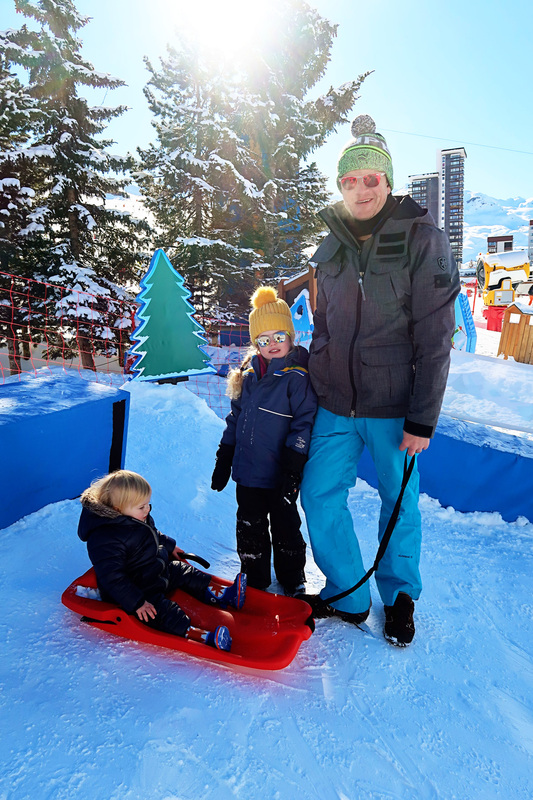 With Ski Famille there are free sledges you can take out of the chalet, which is a great touch. 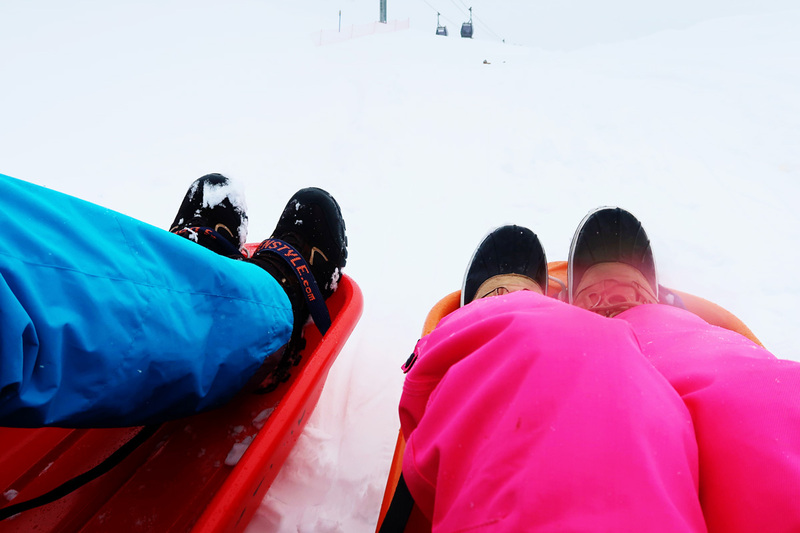 We all had so much fun sledging and the girls and even Wren loved it. 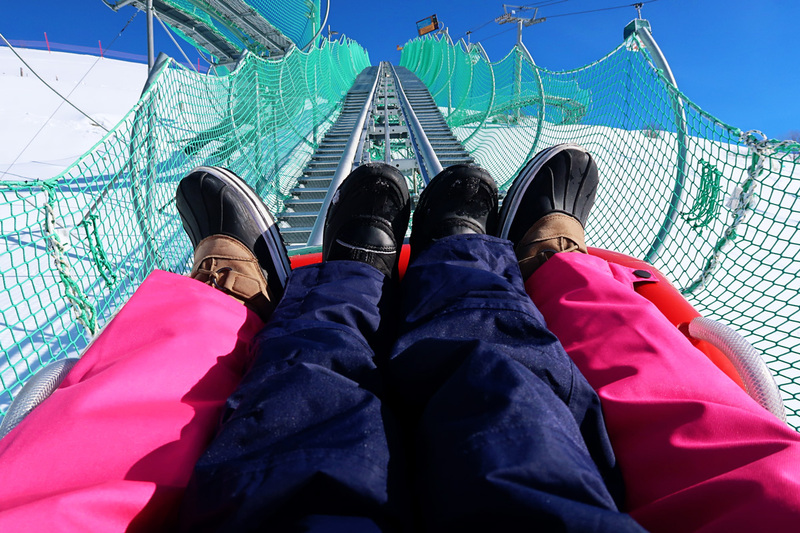 Speed Mountain is an amazing sort of toboggan/rollercoaster on rails on the middle of a mountain. It has three speeds and you can ‘race’ against Boukty the resort mascot. We didn’t know what to expect when we went on it but it actually goes so fast (if you want it to) and was hilariously fun. The girls (and I) screamed all the way round (you need to watch our second video for the full experience – we ended up going on twice because we loved it so much. It’s quite the experience zooming around a track with a beautiful mountain view all around you. At the end you can purchase a photo for a couple of euros which is quite a nice memento too. Chances are if you hear someone talking about skiing then they will no doubt start talking about Apres Ski too. 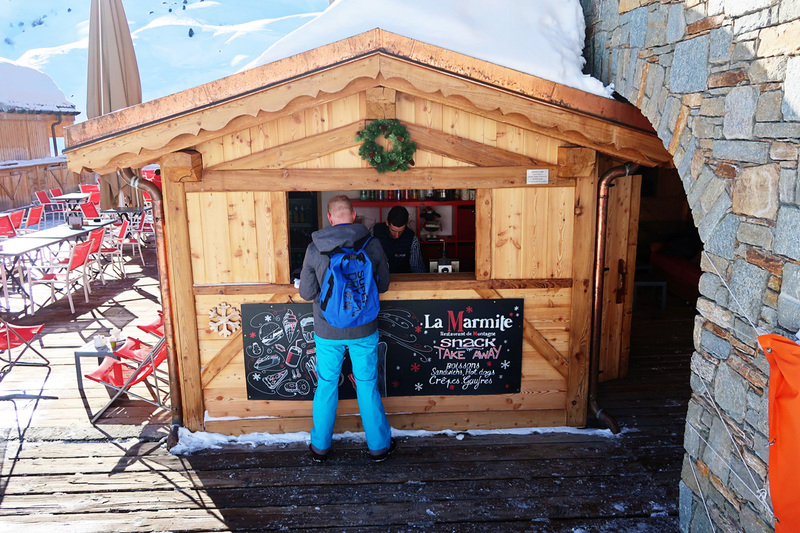 Quite simply apres ski is the social activities and entertainment following skiing. Now in many cases this can mean a few drinks, but it doesn’t have to. 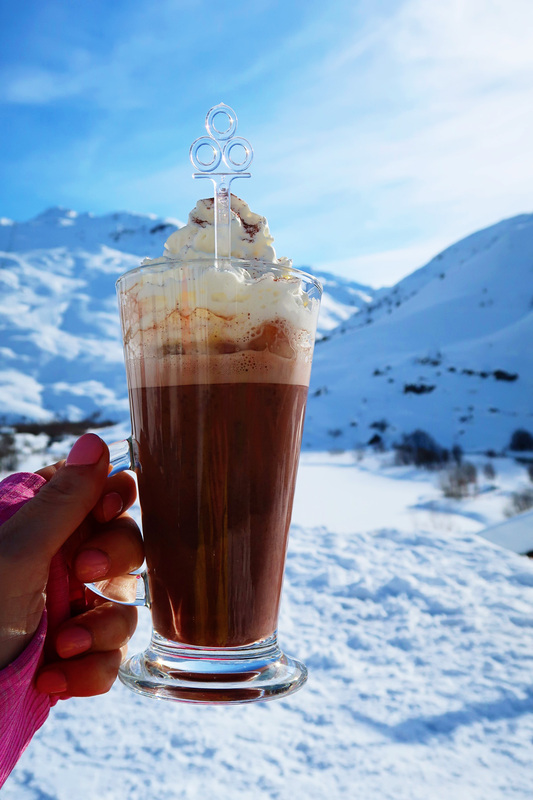 It could simply be having a hot chocolate on top of the mountain while you take a break from skiing. I love the whole concept of apres ski. 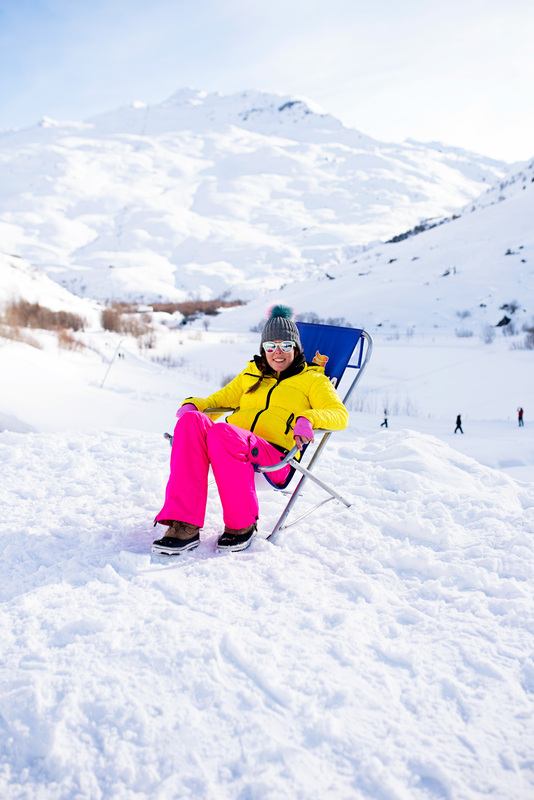 There is just something so incredible about sitting on top of a mountain on a deck chair with the sun blazing down on you and snow all around you. 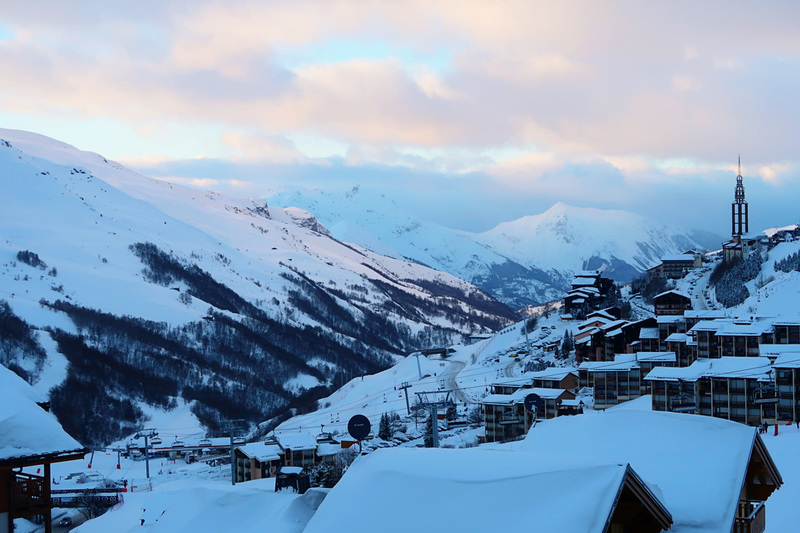 Les Bruyeres is a quiet, family focused resort but there are more than enough restaurants, mountain bars, and entertainment to keep you occupied. 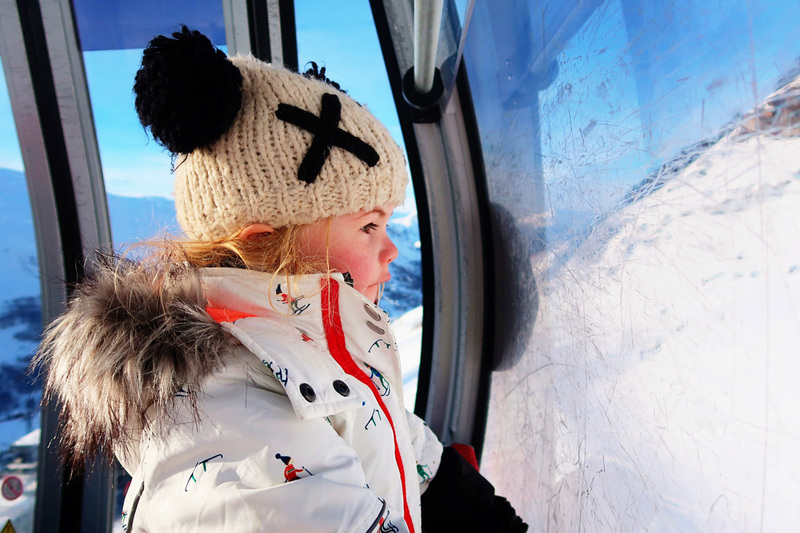 One of my favourite things to do is take the children up in the lifts and sit in a mountain restaurant with stunning views. 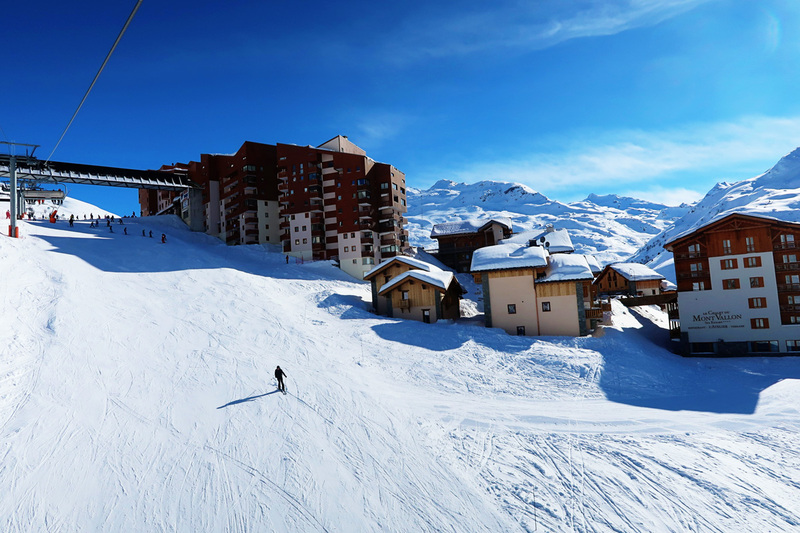 Les Bruyeres is a beautiful resort set in the middle of one of the biggest ski areas in the world. There is so much to see and do, and more importantly there is snow! One of our favourite things to do is just explore. To wander, go for long walks, head up in the lifts and see the views, play in the snow, make snowmen. Just be outdoors and enjoy it. There is something so wonderful about just being outdoors and finding little spots to play and explore. I often get people ask me what there is to do if you aren’t a keen skiier- the answer is so much. 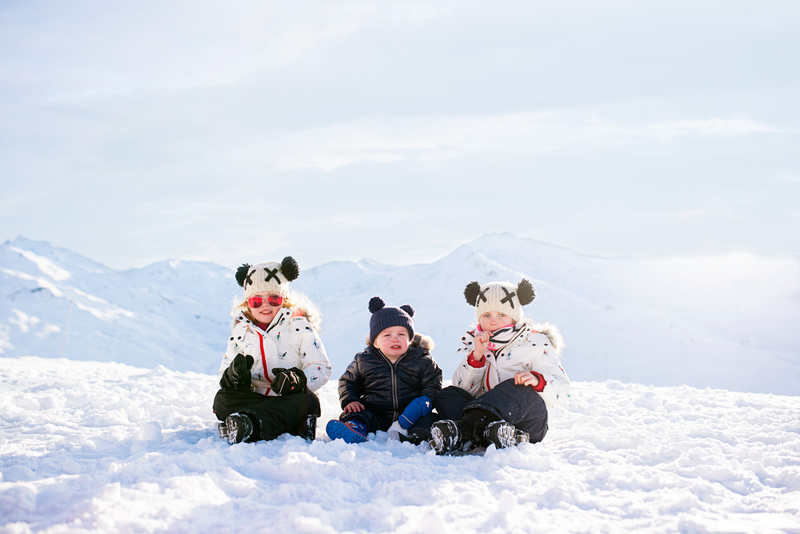 It’s just an absolute dream for little ones who love to be outdoors and enjoy time together. NB: Thanks to Ski Famille for inviting us on this amazing trip in exchange for creating content based on our experience. All words, opinions, photos and video content are entirely my own. Head over to their website to find out more about booking a ski holiday through them. Looks like you had SUCH a great week. Love when you get a good sunny snow week. I’m so envious – the snow has been amazing this year and it’s the first time in ages we haven’t skied. You’ve inspired me to get booking for next season! 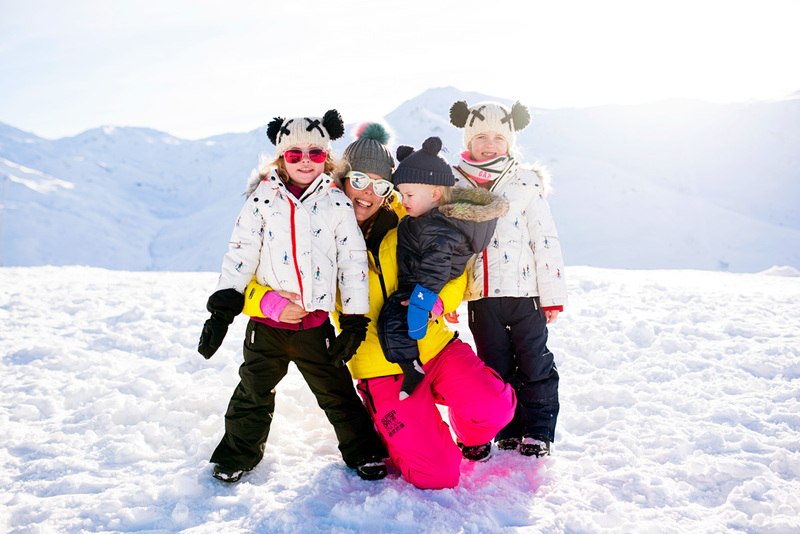 Skiing is one of the best family activities. It’s super fun!